A dog that does not travel well can present a number of problems due to the restriction this can place on the owner. Though the dog does not realise it, it is also likely to inhibit the amount of exercise or activities the dog and owner might otherwise enjoy, which will often start with a car journey. Whether over-excitement, anxiety, protective behaviour or motion sickness related, this is an area that often responds well to the correct treatment. Aggressive behaviour whilst in the car is not uncommon, and this is often related to guarding behaviour whilst inside. Dogs can become protective of pretty much any space and once with the owner in an enclosed space such as a car, the protective behaviour can increase in the dog. Should you experience this, a comprehensive review of the human-dog relationship and the dog’s behaviour away from the vehicle would be necessary before we then move on to look at the particular set up in the vehicle, such as where the dog travels, how much it can see. The type of vehicle can also have a bearing on such behaviour as some dogs may be on the front seat, some on the back seat and some in the rear of the vehicle. If your dog does show aggressive behaviour to people outside of the car that may approach, or even try to enter the vehicle, then you must consider the safety aspects. Points that come to mind are muzzling your dog and ensuring it is tethered using a secure device such as a body harness like this one on Amazon slotted into a seat belt clip. If you already have a body harness, this little attachment is useful for the seatbelt over at Amazon. Use of a dog guard when your dog is in the boot, or better still, placing your dog in a secure crash-tested dog cage or crate designed to fit into the rear of your specific vehicle. If you own a small dog, it might suit you better to use a small, soft dog crate like this one on Amazon on the rear seat provided it is well strapped down. Interestingly, the car can also be classified as a ‘public place’ under the Dangerous Dogs Act. So if your dog acts aggressively towards people in the vehicle, then you need to be aware of the legal ramifications. The Highway Code states that drivers should ensure that dogs or other animals are suitably restrained so that they cannot distract you while you are driving or injure you, or themselves if you stop too quickly’. Failure to adequately restrain your pets in the car could invalidate your car insurance, you could be made to pay for damage to the other vehicle, if one is involved, along with medical costs where applicable. So dog’s heads out of windows, dogs standing between the driver and passenger seats looking forward helping with gear changes, dogs on rear parcel shelves, not to mention dogs on the driver’s lap during a journey (I’ve seen that a few times!) are all not only being poorly managed, but an offence is being committed. Also, see the section 'Dogs Die in Hot Cars' at the foot of the page. Dogs that are used to travelling in cars to get to the locations that bring them lots of fun and exciting things to explore can quickly build an excitable association towards the car itself. This is quite understandable and we want to see out dog keen to enter the car and to go on a walk. However, this can sometimes swing to the far opposite, whereby car travel can become a stressful routine and journey for the owner, whilst the dog is constantly barking and leaping around in the vehicle. This can be highly distracting for the driver and create a potentially dangerous driving experience. For such behaviour, I like to wind the situation all the way back to the initial preparation stages of putting the lead and collar on, leaving the home, approaching the car, entering and then of course control once inside the car. Let’s look at that in more detail as I would always do this for car travel problems of this nature. When in the home ask your dog to sit and wait nicely before the lead is placed on. Take your time and once the lead is on you can hook it over a secure point to prevent your dog from racing up and down becoming more excited in the process, should you experience that. Alternatively, if you have a sound Sit-Stay command, use that as you place the dog on a mat or bed as you prepare. This is how I manage my own dogs during the departure phase. This way you can put your coat and boots on with the dog lightly restrained which will help keep your dog’s excitement levels manageable. Going through the various doorways together should also be a calm and controlled experience. You may have a couple of doors to negotiate as you leave the home, a gate at the foot of the garden and then, of course, the doors to the vehicle itself. All of these should be calm and controlled and it will be your job to guide your dog through them. With your dog on the lead, open the door an inch or two and if he tries to push through the gap, then carefully pull back to the closed position again. Your dog may be a little surprised as you may up to this point have always allowed your dog to drag you through each doorway, gate and into the car…this is not at all conducive to a calm car journey! Keep opening and closing the door a little until your dog steps back, look up at you, maybe circles or sits down as a sign to wait for your command. I do this a great deal in my work and it has never failed to work when done correctly. I have written in much greater detail on the subject of going through doorways politely on this blog post. It's important as it sets the dog up on an emotional level at many points in the day, plus it's a very tidy way of maintaining a good degree of control of the dog and for the dog to express self-control at the same time. It's a very good win-win. Once you think your dog is calm enough and willing to let you go through the space first, then slip in front of the dog, turning to face him in the process. Standing in front of the dog, wait for 5 seconds as you count in your head (physically block him if he tries to slip past you) and then calmly ask him to follow you using the words you like/prefer. Repeat this at each doorway and then ultimately you are at the car. Whether your dog enters via a side door or the hatch as it raises up, he must not get in until you give him the command. You now stand a fighting chance as you have created a much calmer dog at the previous doors and gateways. Any attempts at leaping inside the vehicle before you give the ‘Okay!’ should be stopped with the lead and you reset him, wait for calm and try again. So the above can greatly help when coping with the excitement levels prior to entering the car. What about the car journey itself? I have been able to reduce the in-car excitement by well over half on the first session, simply by addressing the home departure routine alone, so please don’t underestimate that element. During car travel, do ensure that your dog is fixed to an appropriate point such as a body harness and seat belt clip as he should not be bouncing around causing a distraction, plus your dog should be a ‘secure load’ for the purposes of the law as explained briefly above. Depending on your dog’s food drive, you may be able to do something as simple as offering a Kong stuffed with something amazing like a dob of peanut butter or cream cheese. I recall a case just like this whereby the big yellow Labrador was barking incessantly in the boot space of a Volvo estate. We simply gave him a Kong with cream cheese inside and he was silent forever more as his lady owner made the 10-minute drive up the road with him to the fields. Some cases can be that easy, but alas most aren’t. Look at filling the Kong more fully with a wet dog food and then if you know your dog will work on it, providing it frozen could give you the extra time working on it which is likely to equate to a calm and quiet dog. Bliss. This is the type of Kong I would use in this instance. Another food-based trick is to have two people working on the dog’s behaviour. 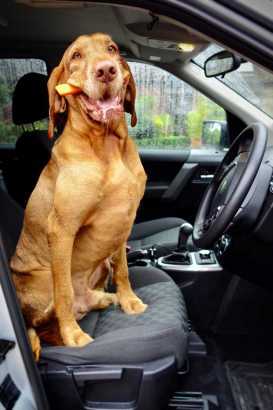 One person drives and the other can gradually distract the dog away from its excessive behaviours and feed the dog with high value treats to reward the quiet moments when they come along and often with suitable food motivated dogs we can keep them in that zone for the duration of most journeys to the park. A few weeks of daily pro-active work like this can make the world of difference and I favour this approach for many behaviours the dog may be exhibiting in the car. If you’re doing it all alone and don’t have the prospect of another helper, then you can look at ways in which you can initially block your dog’s view as you drive and to distract him in a positive way for the journey (see comments re the possible use of Kongs above). A nice way to achieve this is to place your dog in a crate during car journeys and then to simply cover it with a light sheet to obscure its view as you drive. In some cases, this can effectively address unwanted barking in the car there and then. This raises a few issues though. Can you fit a crate inside your car big enough for your dog and will your dog willingly go into a crate? ‘No’ can often be the answer to one or both of these and so if that’s the case, we can either spend time introducing the crate assuming one will fit your car, or that we set aside the rear of the vehicle for the dog and then to use card cut to shape and then stuck to the side and rear windows to block your dog’s view. It may sound a little excessive, but what your dog can’t see - it can’t bark at. You can then spend the coming weeks driving like this whilst ideally your dog works on the Kong fresh or frozen and that as a result you effectively set up a new experience and expectation for your dog. The old behaviour gradually becomes extinct. During this time you may also be working on other behaviours away from the car, but we would establish and address those elements should we be working together. After a month or two of successfully calm and quiet journeys, you can begin to allow small spaces of vision so that you can test your dog’s response to the view again. Move forward and back on this method depending on your dog’s behaviour as you reveal more of the view. This is relatively common, especially with very young dogs that have yet to become used to car travel. For many puppies, their first car journey will be an anxious one as they are removed from the litter and face a drive to their new home with the owner. I have experienced this with a few of my own dogs, but the bottom line is that whilst I tweak things a little to make the dog as comfortable as possible, I keep taking them out every day and they will soon settle down and even come to love car journeys. Stopping is the worst thing to do, as it causes a 'block' that you’ll need to clear later on. Don’t feed your dog an hour or two before car travel, maybe longer for some dogs. Be sure that your dog is not being rocked and rolled about in the car. Consider a crate that restricts movement and using a rubber base helps prevent slipping. This one is highly rated on Amazon. Try to keep your upcoming car journeys very short. Drive to the park, have a good run about to shake it all off. A 30-60 minute walk should allow the dog to become entirely settled and then you can return home. I would not usually advise providing chews on a car journey whereby the dog is experiencing car sickness, but by all means, try it. Dogs That Have an Aversion to Getting in the Car. I have seen numerous dogs that simply cannot face the prospect of getting in the car and then being driven to a location. The dog may not jump into the vehicle of its own accord and may resist being lifted into the vehicle. Once inside the vehicle, the dog may then shake or attempt to escape. All of this is understandably quite frustrating and upsetting for the owner. Overcoming this requires a steady and thoughtful approach over a period of a few weeks. With food driven dogs (thankfully most are) I have had success by using meals or mini meals as we gradually approach the car and then to eventually feed the dog in the car as it remains still. If not using the dog’s main food (I might switch it up to a high-value wet food such as Forthglade) I would establish which high value treats work best for the dog, such as chicken slices so that we get as much of the do’s attention possible. We know that car travel can bring a lot of fun for the dog, but they will need persuading over a period of time. I sometimes look at additional tools such as steps or ramps for dogs as this can in some cases take away the stress of actually getting in. This dog ramp over at Amazon is a good choice. It is helpful to consider every single dynamic of getting in the car in the first instance and then once in we can look at ways to make the dog feel relaxed and comfortable. Once in the car, we can look at stuffed Songs to distract and reward. You might also like to consider other methods of travelling with your dog, such as in a crate, on the back seat attached securely on a harness to the seat belt point. I am not averse to the front passenger footwell depending on the size of the dog and that it remains laid down there and not distracting the driver. When you have overcome the problem of getting your dog into the car and can also shut the door or boot lid, you can either keep the dog there for a while and then release out in a controlled way, or if the dog can cope, you can go on a short journey. A driver and then a helper to reward and guide the dog a little in the car can help a great deal. The length of the journey is likely to depend on the severity of the dog’s behaviour once in the car. It could be anything from 1-5 minutes in the starting phase. Do this anything up to three times per day, but be sure to observe the dog’s behaviour, so that it is not being excessively stressed on each occasion. It is normal to see some resistance and stress in the process, but don’t put your dog into a meltdown each time. As the dog settles down, you can increase the duration of the journey. Once your car journeys are long enough, make the journey to a favourite walking location for your dog. After a satisfying walk, come home in the car again. This is an important component in helping the dog understand that car journeys bring lovely, positive experiences. Dogs die in hot cars and numerous cases of this are reported each year. People fail to recognise or understand how very hot a locked car can get and equally how unable a dog is to manage to regulate its temperature when things get this serious. It is an offence under the Animal Welfare Act 2006. If found guilty, it is up to six months in custody and/or a fine of up to £20,000. Never park in the sun with your dog in the car and then leave. Always park in the shade providing your dog with water and fresh air. Use a tailgate lock to allow ventilation with the vehicle locked. I use this one on the Land Rover available at Amazon. Always use the air conditioning when driving in hot weather. Consider a fan inside the car when parked in the shade in warmer weather. I use this battery-powered one and it helps pull the aircon to your dog's location in the car. Also good when moving. It's likely I'll upgrade to this 12v fan which I've seen as it's more powerful. Provide fitted window shades so that direct summertime sunlight is not hitting your dog. These sunshades on Amazon are excellent. The RSPCA’s website offers more information regarding dogs in hot cars here.